CREATE THE IDEAL CLIMATE FOR YOUR HOME. No matter what your weatherman says, we’re certain your home can be toasty warm all winter and refreshingly cool throughout the dog days of summer. But just as important, we can safely forecast a pattern of fresher, healthier air for years to come. And we predict you’ll be able to control all the elements—whether you’re at home or half a world away. Perhaps best of all, we’re calling for lower utility bills for the forseeable future. That’s what life is like in the world of Carrier® comfort. You don’t need a passport to get to an ideal climate like this—just a complete Carrier heating and cooling system. We invite you to explore what’s possible. Optional Air Quality Accessories such as Air Cleaners or Ventilators—Clean your air before it circulates throughout your home. 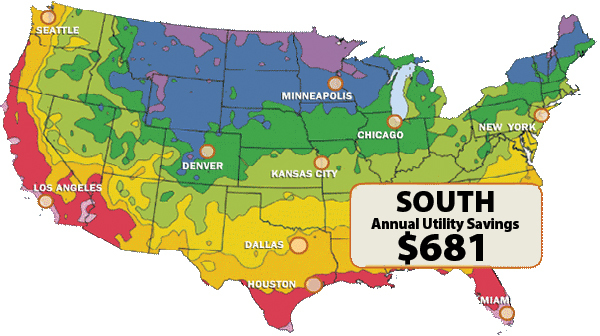 Average savings for households located in the South who replaced conventional systems with Carrier’s energy efficient Hybrid heating and cooling system. Carrier Hybrid Heat™ Systems combine the strengths of two heating sources to deliver the warmth and efficiency you deserve this heating season. Yet it also cools your home in the summer and there’s money savings potential there as well. The Hybrid Heat system is so efficient, the cost to heat with it is less than with any gas furnace alone — even a 100% AFUE furnace!